Through a unique, proven online system Expr3ss! quickly and cost-effectively matches and pinpoints only those applicants with the right skills, attitudes and cultural fit required. It's Australian software, it's web-based, it's the unique predictive hiring solution for any business; and it works. Take back control of your own recruitment. Watch the stars rapidly rise to the top! One click sifts, sorts and pinpoints applicants matching the ‘Can Do’ skills you need. It's a breeze. Another click and the proven Expr3ss! 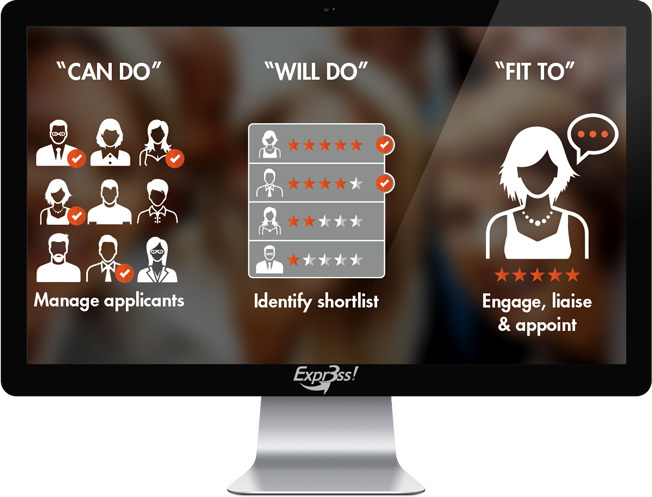 predictive hiring algorithm matches the 'Will-do' "stars" to make a shortlist. Then engage, liaise, collaborate and appoint 'Can Do' people who 'Will-do' the role and 'Fit To' the team and business. iPhone, iPad, Android, Tablet… you name it we have it covered… wherever you or your applicants may be. Mobile applications are on a meteoric rise. So we've made it even easier for your applicants, whatever their device. "Organisations using Expr3ss! Predictive Hiring typically realise a fourfold return on their investment." Unlimited Jobs, unlimited Applicants, unlimited Logins, unlimited Emails, unlimited Resumes, unlimited Progress Notes, unlimited Visa Checks… even unlimited one-way Video Interviews. No surprises or hidden charges. All browsers, all platforms, all devices. Fully mobile friendly. Customised to match your brand identity, deployed, fully functional and ready-to-use in 48 hours. We write your first Job Ad, set screening questions and automatically publish on the top 17 free job boards. No additional technology or installation required. Simply use any web browser, tablet or mobile. Protected in a Tier 4 Rackspace® Data Centre, backed up every millisecond, SSL encrypted at rest and in transit. We keep your data safe, secure and never share it with others. And we want you to use Expr3ss! because you love it, not because your data is stuck in it. You own your own data and can export information from Expr3ss! any time you choose. 1800 free-call phone support, rapid-response Help Desk and instant Live Chat staffed by our own dedicated in-house support team. Free Cultural Survey: extensive psychometric reporting on any or all of all your people… your choice of whom. Explore your organisational culture, assess teams, understand individuals. Gain priceless management intelligence… entirely free in your first 30 days. Cut 99% of inappropriate resume reading. Free your inbox, eliminate time-wasting in-calls, liberate time and speed time-to-hire. Grab the best applicants before your competitors do. Predictive hiring algorithm removes time wasted on unsuitable applicants. Replace wasteful telephone and first interviews with built in free, one-way videos. Altogether abolish wasting time on serial and nuisance applicants. Unique predictive hiring expert system algorithm proven in the field over 13 years, using AI for constant improvement. Eradicate external recruiter costs, slash advertising budgets, speed processes, eliminate guesswork and cut hiring mistakes. Match the right person to the right job, improve productivity and boost retention of the best of the best. Names, dates, referrers, addresses, work history, education, recruiter progress notes, emails, 'can-do' skills, and especially 'will-do' attitudes and 'fit to' role. All in one rapid, powerful and detailed Search View. Manage all your new applicants in one place, across all your jobs… it's a breeze! Did you know that 70% of job applicants now come from free sources? Job Aggregators (think Google® for Jobs) are rapidly replacing paid job boards. Research shows that Applicant quality is equal to the old paid job boards. Automatic feeds from your Expr3ss! service ensure speedy, maximum coverage on 17 free Job Aggregators (e.g. Indeed® Glassdoor® Jora®). Set three, four or five specific questions for Applicants to respond to in a one-way video, made using any camera-equipped computer, smart-phone or tablet. Review the video at your convenience on demand on any computer or device. Eliminate time-wasting telephone interviews and replace first interviews with the method that's revolutionising recruitment. Tired of wasting time playing telephone-tag with applicants to arrange interviews? Self-service interview calendar makes it a breeze. Improve your applicants' experience, eliminate to-and-fro calls, add special instructions, use last-minute messaging to handle changes. Individual Interviews, Group Interviews, Telephone Interviews, time zones?… we've got you covered. Expr3ss! includes a fully-featured Job Requisition system. Job Requisition makes collaboration and decision-making by the team a breeze. Logins are not required to be included and be an active collaborator. A full audit-trail tracks the process with clear indications of approval to go ahead in advance of actively recruiting for a role. Measured improvements in staff retention, productivity, engagement and bottom-line profit. Proven time after time across all industries and all job grades. From blue collar to C-suite… it works! Ask us for a white paper relevant to your industry and recruitment challenges. Radio Rentals® doubles staff retention, Krispy-Kreme® saves 67% on Job Ads, Laser Group® slashes time-to-hire by 33%. Flexibly evaluate your recruitment end-to-end. Measure applicant attraction, advertising channel effectiveness and associated applicant quality, time-to-fill, time-to-appoint, application rates, communication types and rates, applicant and appointee demographics, appointed applicants vs quality. Enjoy powerful, flexible, always up-to-date immediate reporting. Add zoomable QR Codes integrated into emails, flyers and posters… add to trucks, uniforms and even hard-hats! Applicants scan the code with a smartphone to navigate to a job (or grouping of jobs) instantly… no typing, no mistakes, no worries. "First things first… it's not complicated. And yet it has so much depth to it." Free Job Advertising and Promotion via JobStr3am! And benefit too from social promotion via our Facebook and Twitter streams. All done at no cost and with absolutely no work from you. Let us show you around! Contact us today to book a Web Tour. save time, save money and avoid costly hiring mistakes. Job seekers! We are not ourselves the recruiters… it's our customers who do that. To find and apply for jobs look for our JobStr3am on Facebook and Twitter or download our iPhone or Android App. Copyright © 2005 - 2019 Expr3ss! Software that Simplifies Staff Selection.